When Bowser dies at various points in Mario & Luigi: Bowser’s Inside Story, the brothers have to revive him by shooting adrenaline into his heart. 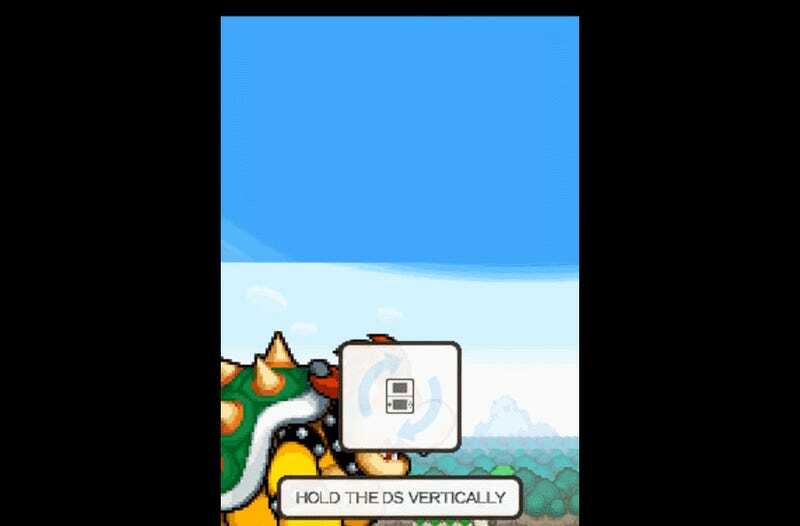 Doing so leads him to get back up and become giant Bowser for a special mode that requires players to hold the DS sideways like a book. Suddenly, the game’s graphics play out across two adjacent vertical screens. Players use the system’s stylus to guide the King of the Koopas through danger. It’s a shame few other games in the DS or 3DS libraries have tried something similar. “The thinking that we had behind holding the DS like a book for [Bowser’s Inside Story] was because we had an idea of Bowser growing gigantic to fight and we thought that that would look pretty cool,” Shunsuke Kobayashi, Director of AlphaDream, the studio behind the series, told Kotaku in a phone interview. When Bowser gets big you have to flip the DS (and now 3DS) vertically in order to play. Mario’s original creator and Nintendo’s longtime top designer, Shigeru Miyamoto, was apparently into the big battles, too. “At the time I remember the team bringing the DS to Mr. Miyamoto and showing how this part of the game worked and flipping the DS to the vertical way and he dug the idea,” Kobayashi said. 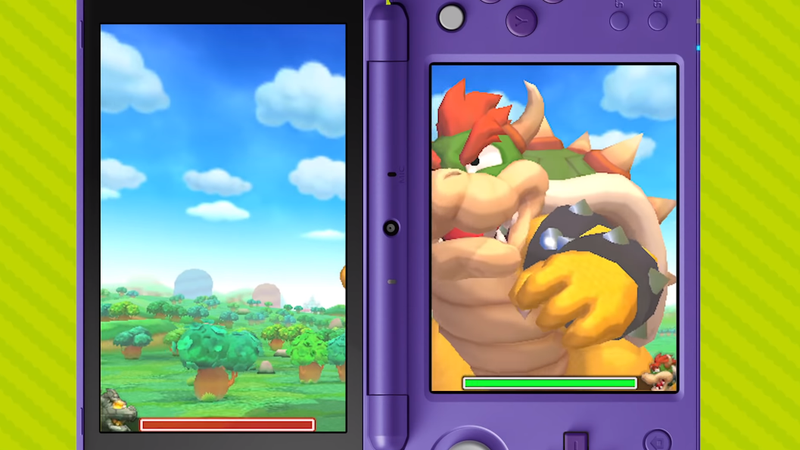 The sideways giant Bowser battles also appear in the new 3DS remake of Bowser’s Inside Story, although this time players make Bowser blow fire in them by tapping the touch screen rather than blowing into the mic. The sideways format was also carried over to 2013’s Mario & Luigi: Dream Team, which features giant dream Luigi in battles. A giant Bowser sequence from the original game on DS (left) compared to the remake (right). Despite how impressive these moments in the Mario & Luigi series have been, few other games on the DS or 3DS have invited players to turn the systems on their side. The Brain Age series on the DS did, which made sense because the games worked like interactive puzzle books. The 2015 puzzle game Dr. Mario: Miracle Cure had a Virus Buster mode staring Dr. Luigi where players had to hold the 3DS sideways and guide pills with the stylus instead of the d-pad. Holding the 3DS like a book has been used in the puzzle game Bomb Monkey, but it has rarely been in action games, likely because of the way it limits a game’s possible control schemes. “It’s really difficult to access the buttons when you’re holding it like that and that’s probably way more games don’t use it,” Yoshihiko Maekawa, a producer at AlphaDream, said. Now that the 3DS is near the end of its life-cycle and Nintendo hasn’t yet shown signs it plans to continue its dual-screen line of handhelds, games in the future probably won’t get the chance to experiment with it. Then again, the Switch sure can be held sideways in handheld mode.